Kongorinji temple, a National Treasure More Aisho photos here. Google Map of Aisho here. Sister Towns West Bend, Wisconsin, USA; Nakagawa-machi (那珂川町), Tochigi Pref. Last updated: Oct. 12, 2017 This page is 75% complete. Aisho (愛荘町; -chō) is a town in eastern Shiga Prefecture. The town is near the geographic center of Shiga, east of Lake Biwa and between the northern and southern regions of Shiga. Its main attraction is Kongorinji temple which is a National Treasure. The Nakasendo Road also passes through the town with Echigawa-juku as the 66th post town. 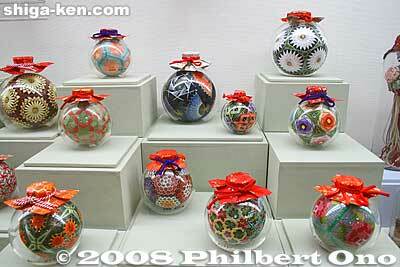 One symbol of Echigawa is the bin-temari threaded ball fitted in a round glass bottle. Blessed with two major rivers, the Echigawa River and Uso River, forty percent of the land is devoted to rice and other agriculture. The town is also a textile-producing area, known for indigo and hemp fabric called "Omi Jofu." The town was formed in Feb. 2006 upon the merging of Echigawa and Hatasho towns. The name "Aisho" combines the first kanji character of "Echigawa" and the second kanji character for "Hatasho." July-Aug. - Aisho Summer Festival and fireworks. Late Aug. - Nakasendo Shukuba Festival in Echigawa 中山道宿場まつりinえちがわ is an evening festival with candlelight illumination along the old Nakasendo Road, stage entertainment, food stalls, etc. Late Oct. - Echigawa-juku 66 Festival 愛知川宿66番祭 features stage entertainment, flea market, and more. 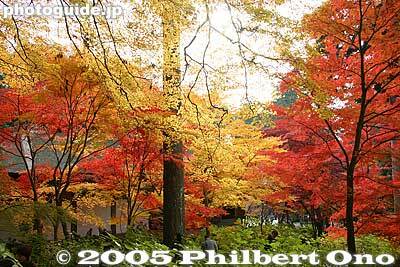 Nov. - Autumn leaves at Kongorinji temple - Shuttle buses run during the foliage period to this and two other temples. The Echigawa Station building is also a nice community house providing tourist information, a gallery (Gallery Louvre Echigawa) るーぶる愛知川, and gift shop. During autumn in Nov. when the leaves are colorful, a convenient shuttle bus from the Hikone Station can take you to the three Koto Sanzan temples which includes Kongorinji temple. Aisho has only one train station, Echigawa Station on the Ohmi Railways Main Line. However, Inae Station on the JR Biwako Line and Toyosato Station on the Ohmi Railways Main Line are near the fringe of the town. From Tokyo Station to Echigawa Station: JR Tokaido Shinkansen to Maibara Station (2.5 hours), then transfer to Ohmi Railways for Echigawa Station (31 min.). Buses run from Toyosato Station, Inae Station, and Notogawa Station. From JR Inae Station and Echigawa Station, buses leave for Kongorinji Temple. Buses run infrequently and only on weekdays. There is a rental bicycle shop in front of Echigawa Station. Ask at the tourist info counter in the Echigawa Station building. More photos at Aisho Photos. More Shiga photos here. Click on the video image to start playing the Misaki Shrine Fire Festival video. More Shiga videos here. Other sights in neighboring cities/towns within easy reach from Aisho. 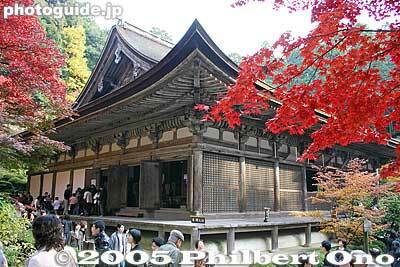 Koto Sanzan temples - Three noted temples with National Treasure or Important Cultural Property buildings. Besides Kongorinji, they are Saimyoji and Hyakusaiji in Higashi-Omi. Beautiful especially in autumn when a shuttle bus links all three temples. 2006 - On Feb. 13, Echigawa and Hatasho towns merge to form Aisho town. The town's name of Aisho 愛荘 was taken from the first Japanese kanji for "Echigawa town" 愛知川 and the second kanji of "Hatasho town" 秦荘. Native of the former town of Hatasho-cho, and founder of the Hakone Tochi Co., the forerunner of Kokudo Co. which operates the Seibu Group including Seibu Railways and other companies. The company also operates the Ohmi Railways and bus lines in Shiga. One son is Tsutsumi Yoshiaki, the disgraced president of Kokudo born to a mistress. This page was last edited on 7 December 2018, at 01:35.